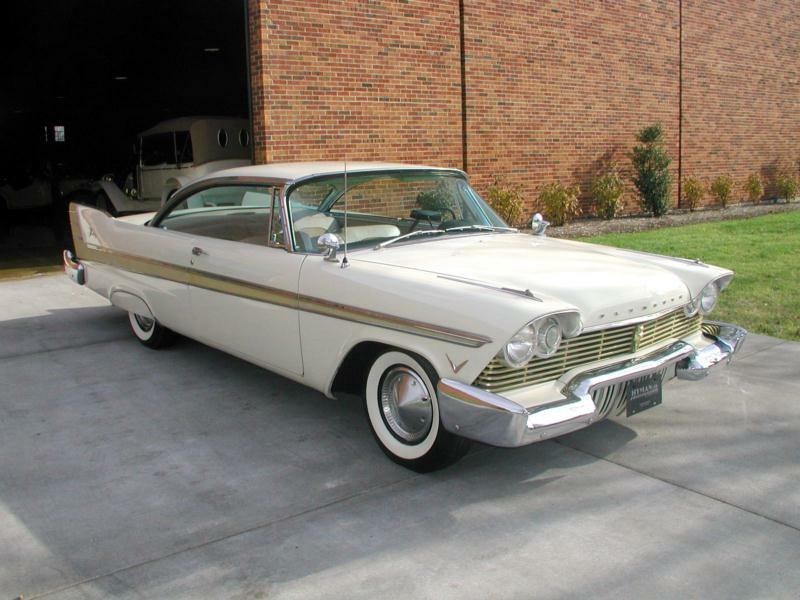 Chrysler’s Plymouth brand was in a tough spot in the mid-1950s, but a competitor with the unlikely name of Plymouth Fury was introduced midyear in 1956. The engine was a V-8 of 303 cid with two-four barrel carburetors belting out 240 hp, far exceeding the other Plymouth V-8s. The exterior styling, with a body based on the 1955 shell, was improved. The exterior and interior trim was freshened and the car available solely in Eggshell White with gold anodized accents. A heavy-duty suspension, police brakes and tachometer were standard, and the price was $2,866 and up. Fewer than 4,500 were built, but precedence was set. Plymouth wasn’t just a fuddy-duddy low-priced car anymore. Fewer than 500 units divided Buick’s third place to Plymouth’s fourth in the 1956 sales race. Best yet, Chrysler Corporation had a big surprise for competitors for 1957: truly all-new cars, not just a rehash or redo or a reskin. Lower, longer and wider with long and high tail fins, big windshields, and spectacular styling by the design teams headed up by Virgil Exner. It resulted in a third place score for Plymouth, with sales soaring past Buick. 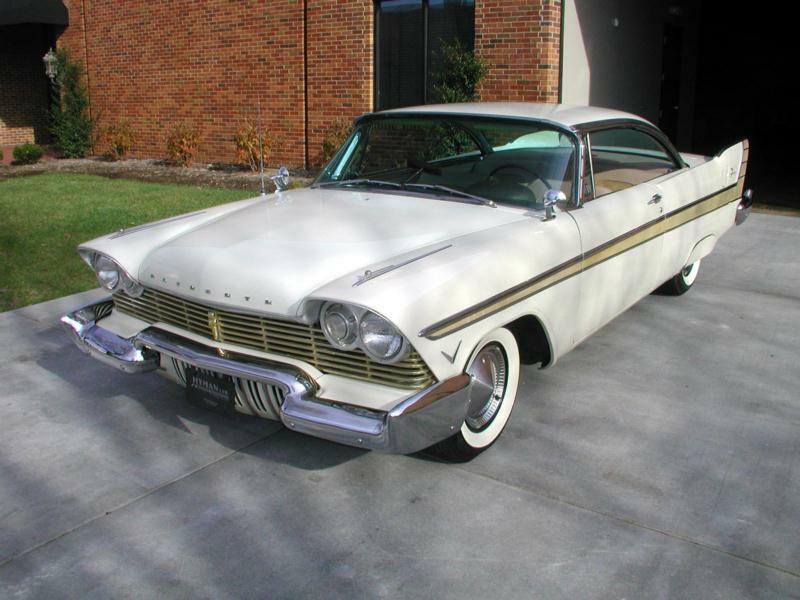 With just under 7,500 sales was the Plymouth Fury two-door hardtop, this time with 318 cid and a full 290 hp, once again available only in white with gold anodized trim. 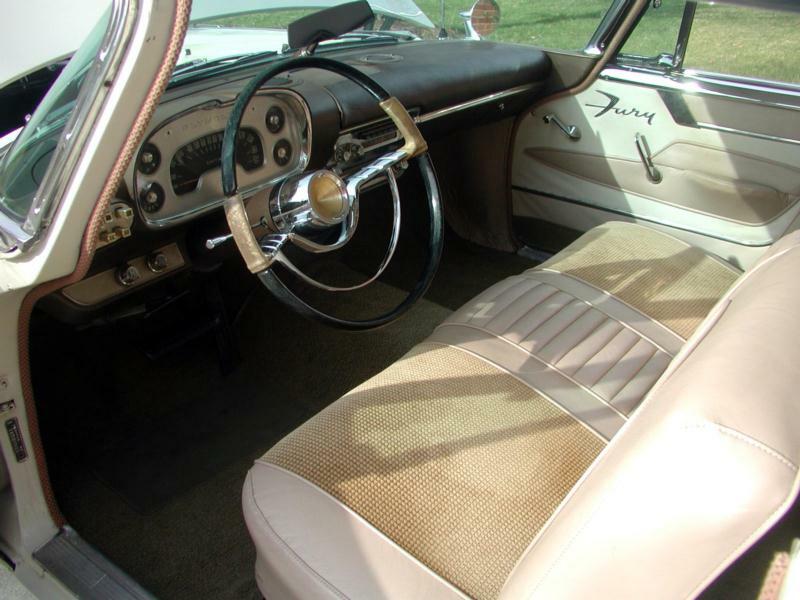 The Fury was a genuine up-scale muscle machine intended for fewer buyers when compared to Ford’s now newly upscale Fairlane 500 and Chevrolet’s Bel Air, and it did its job of being a “halo” car to bring punters into the dealerships. Plymouth once again fielded a sole two-door hardtop Fury for 1958 using new dual headlamps as well as revised grille and detailing. The 290 hp 318 cid V-8 was again standard, but Chrysler’s all-new 350 cid V-8 wedge-head engine with 305 hp was optional at extra cost. 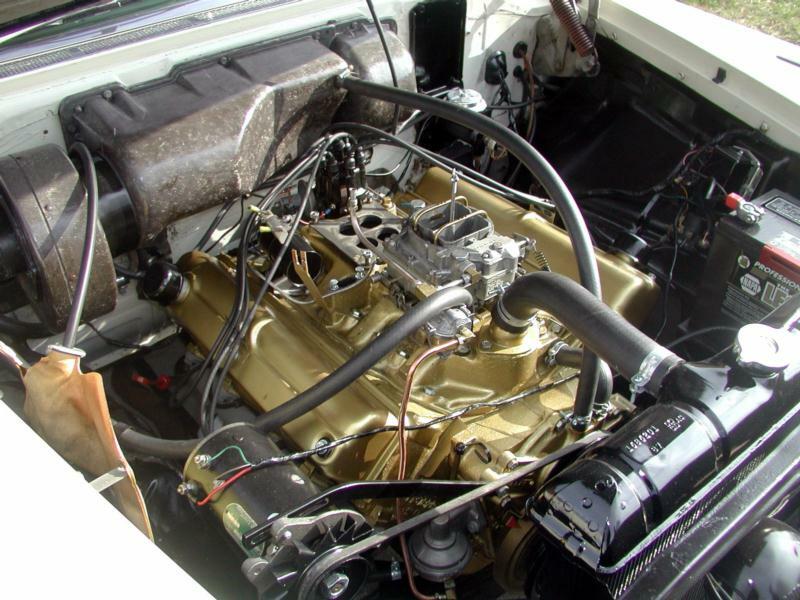 It was billed as Plymouth’s Golden Commando V-8. Shocking to competitors and buyers alike was the (very highly priced) extra cost option of electronic fuel injection on this engine, netting 315 hp. Few were sold, and virtually none ran right (or for long, without carburetor replacements being supplied). 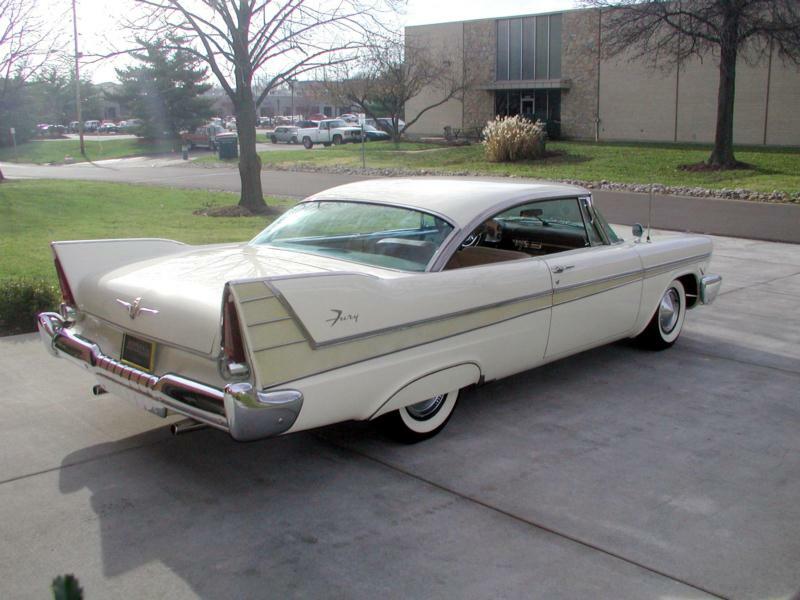 Plymouth’s 1959 cars were stylish and once again quite new, based upon the 1957-1958 body shells, albeit with a reskin. In a bid to win, the newly top-of-the-top-line Sport Fury finally added a drop-top version to the fold. In fact, the new Sport Fury still had the 318 V-8 (now with 260 hp) standard, front swivel bucket seats newly standard, and a larger optional (carburetor only) 361 cid Golden Commando V-8 of 305 hp but with more torque. Alas, competitive pressure made sure that the Fury name was now attached to a car above the Belvedere and below the Sport Fury. The new Fury was now available in hardtop coupe, rather mundane four-door sedan and rather striking four door hardtop body styles, with the 230 hp 318 V-8 standard and all other V-8s optional at extra cost. Fury sold over 65,250 cars for 1959 and Sport Fury sales went up to 17,867 coupes and 5,990 convertibles.